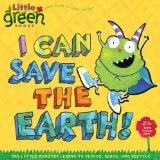 You will also be interested in our page highlighting picture books about caring for our environment, recycling, reducing our environmental footprint and more. Terrific resources for Earth Day and Arbor Day. After taking time to consider the diversity of animals on earth, a young girl visits a beach along with her brother. Together, they explore a wondrous tidal pool, filled with seaweed, small fish, sea anenomes, starfish. Unfortunately, it is not long before the children discover that the pool has been marred by a rusty tin can and a blob of oil. As the day at the seashore progresses, the youngsters fill a bucket with water, they add sand, pebbles, seaweed and shells before deciding to catch some tiny, live creatures. With their small sandpail marine habitat complete, the children revisit the rock pool and discover that it is no longer beautiful; the discarded, rusty can and the oil are all that remain. Startled at what they see, the children set about returning the sand, pebbles, seaweed, shells and fish to a more eoc-friendly pool. They remove the tin can and draw the oil out of the water using a seabird feather. Satisfied with the progress they’ve made, they decide to enlist the help of other children when checking the tidal pools the following day. Beautiful illustrations and “not-too-much text” make this a lovely eco-friendly read aloud for children aged four and up. This is a picture book that begs readers to discuss not only the story but also the illustrations as Foreman gently depicts deforestation, air pollution and the threat of global warming. Originally published in 1990, a new paperback edition is being published this summer.